Your ultimate ride starts and ends at Mont Du Lac Resort. Mountain biking is an adventure sport. At MDL we take the hassle out of finding the adventure of your choosing by offering on-site trails and a great base for your adventure through our lodging, camping, great food & beverage, all on site for guest enjoyment. Save your energy for the adventure while enjoying our hospitality and services to make your experience carefree and memorable. We invite you to come explore our downhill trails. These tracks were purpose built in conjunction with our partners at COGGS bike club. Nothing like trails designed by bikers to challenge others who share their passion. Today our partnership continues to grow, and we are always searching for ways to challenge riders of all talents and to keep our trails meticulously maintained. *All Mountain Biking trails are closed for the year. 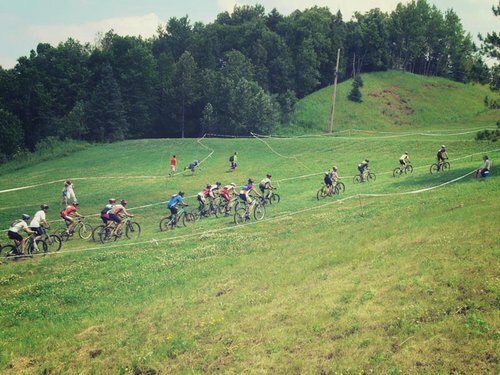 The XC trail is 4.1 -miles with over 828 ft. of decent and 885ft of climbing through a rooty up and down type single track that takes riders through breathtaking cedars and serves up dramatic views of the St. Louis river valley and Jay Cooke state park. The XC trail is great for all levels of riders, serving up a challenge with some of the most memorable views of the area. The DH trails offer 4 trails that will challenge beginners and shredders with berms, bumps, jumps, steeps, and other challenges to test the skills of even the most advance rider. Gateway – is our “easiest way down” and is a 1-mile long beginner trail with 310 ft. of descent. The Torpedo – awesome air, this is our flagship jump trail. Intermediate in difficulty, it has over 25 exciting features and 310 ft. of descent and is ½ mile long. Bigfoot – so if you believe bigger is better, this is an advanced jump trail that joins with Torpedo halfway down – it is 1/3 mile and descends 150 ft. After this run you might just feel like a mystic creature of the northland. PBR – Looking for that hearty, but smooth ride like a cold beverage at the end of a long day? Then lineup for this intermediate jump and flow trail that is ¾ mile long and descends 310 ft.
Grizzly – this advanced trail pits you against the laws of nature, using the natural terrain and obstacles provided by mother nature. This trail is ¾ mile long and descends 310 ft. Just remember if mama isn’t happy ain’t no one happy. Skills Park: Feel like warming up or just playing around? Visit our skills park or just enjoy it while waiting for the shuttle to take you up for the next run. Stay warm between runs, practice skills, or just show off. MDL trails are open 7 days a week, weather and conditions permitting; all riders are required to wear a helmet and that you check in with the staff at the front desk of the base lodge before you go on your adventure. Once you have conquered all the trails we have to offer, or seeking a challenge just a little different than ours… The incredible Mission Creek trail system is only a half-mile away from our doorstep and you can easily access the scenic Willard Munger state-paved trail as well. Visit COGGS for full trail updates and information on the surrounding mountain bike trails in the area. Willard Munger State Trail – this entirely paved trail is easily accessed with a short drive to Becks Rd (6.8mi drive or ride away) or in Carlton (11mi drive or ride away). Mission Creek – is right across the river, less than a ½ mile from our door and has over 20 miles of trail ranging from beginner to advanced and can be accessed from multiple points. COGGS Keene Creek Trail and West Side Brewer Park access – 11 miles from our door and has some great flowy beginner to advanced single-track – 9 miles of trail in this area. East Side Brewer Park/West Side Piedmont Trails Haines Rd. access – 13 miles from our door and has 9 miles of some of the best technical riding in the area. Hartley Park is another great COGGS trail and is only 20 miles from our doorstep and has 9 miles of trail in the park. Lester River Park – a visit to Lester River Park will not disappoint with its unique and challenging trails. This park is 21 miles from Mont du Lac and has 5.5 miles of trail. 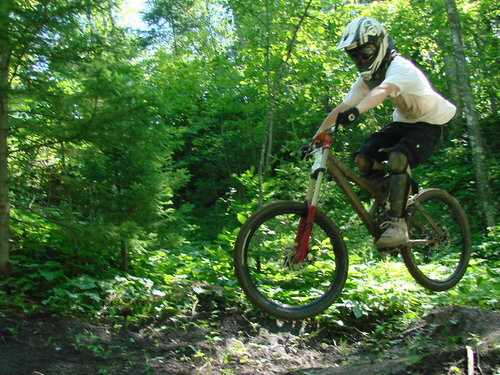 Located on the east end of Duluth, this COGGS trail is non-technical and great for those newer to the sport. Pokegama Trail – This raw and rooty COGGS trail is only 8.5 miles away and is a 7 mile out and back trail in Superior. Pine Valley Park, Cloquet – this is a brand-new trail coming in 2018 and will be a great area to check out for a shorter ride. 2.5 miles of trail and 18 mi away from our resort.